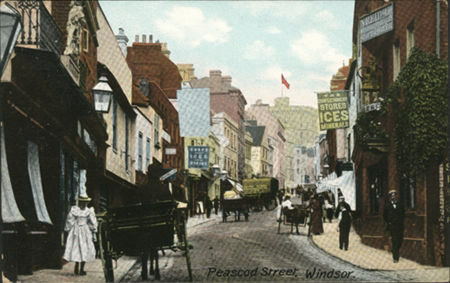 Peascod Street is one of the oldest streets in Windsor, running as it does from the south-west directly towards the main entrance to Windsor Castle. The name derives from 'Pes croft' an area where peas were grown, a staple food in Medieval times. Many visitors to the town pronounce the name too literally as 'peez cod' but it is likely that the local pronunciation of 'pesscot' is closer to the pronunciation in the Middle Ages. 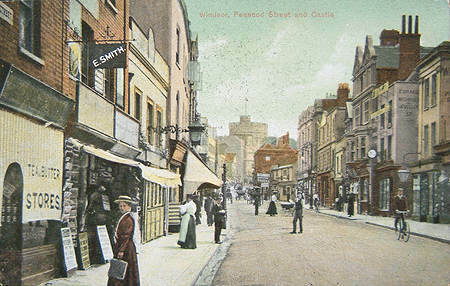 Peascod Street around 1906. 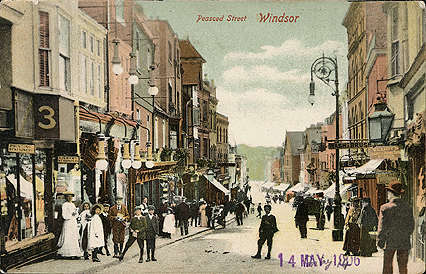 A hand tinted card by W H Smith's of Windsor, in their 'Royal Series' though possibly 'bought in' from one of the major photographers of the day such as Valentine's. 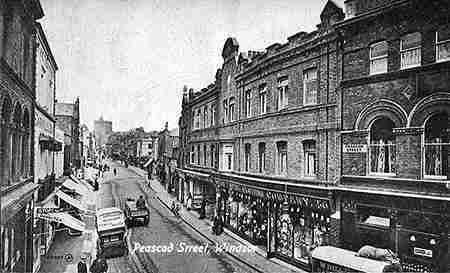 A monochrome view down Peascod Street. 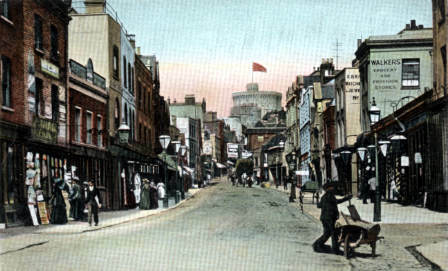 The Star and Garter is on the right, famous for boxing in earlier years. Here is a rare postcard view. 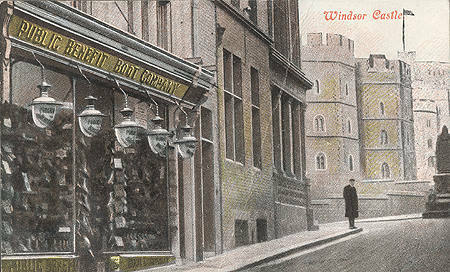 The Public Benefit Boot Company at the top of Peascod Street in a tinted postcard dating from the first decade of the 1900s and posted in Windsor on May 22nd to Slough to a Miss Bubb. The sender, Eva, writes: "Will see you tomorrow just after six. All news then." The five great gas lamps outside the shop are very impressive! On the corner is the current (as of 2006) Barclays Bank building. This attractive painting was painted by a fine Victorian artist, Louise Rayner, about whom more information would be welcome. 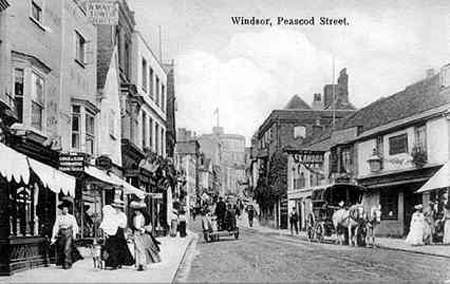 This picture appears in a guide to Windsor dated 1919 although the image itself may be a lot earlier, especially as the horse and carriage seems the main form of transport. This photograph was taken from a first floor window of the Duke's Head Public House, on the junction with Oxford Road. Perhaps the itinerant photographer stayed at the pub that night and thought the view of the castle up the shopping street from his bedroom window would make a popular post card! Peascod Street property numbering started at no 4 on the east side by the High Street, down to no. 72 at the junction with Clarence Road and Victoria Street at the Criterion Public House with no. 73 opposite on the west side and up to no. 143 and Bank House on the corner of the junction with the High Street. The convention of odd numbers one side with evens on the other does not apply in Peascod Street. 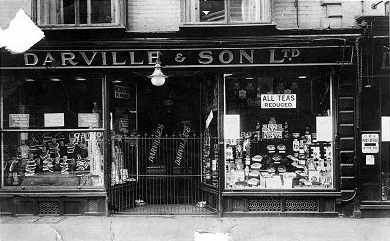 Darvilles are a well known name to Windsorians since 1860 and have been Royal Warrant holders since the reign of King George VI in 1946. 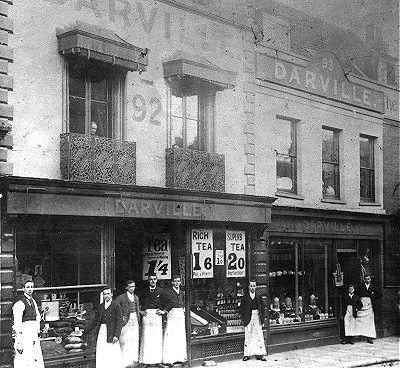 Darvilles are now the oldest company in Windsor to have this recognition of quality and service. Peascod Street was made a one way street, down the hill, on 2nd March 1963. In 1988, lower Peascod Street was pedestrianised between William Street and the Clarence Road/Victoria Street traffic lights. Finally upper Peascod Street was pedestrianised in 1992. 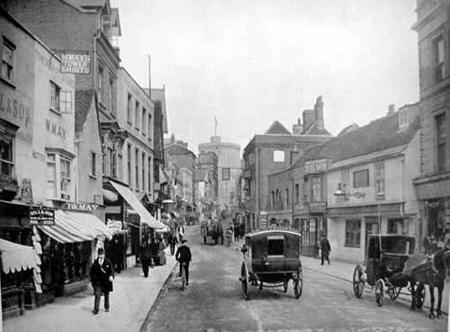 In a leaflet issued by the Royal Borough at that time the design "was intended to reflect and blend in with the historic environment. Traditional materials including York Stone, brick and granite will be used. Some areas will be landscaped and planted with trees and shrubs and attractive cast iron litter bins, seats and street lights will be provided. "A variety of different colours and textures will be used to differentiate between areas which are used exclusively for pedestrians and the 'corridor' for use by service vehicles. Certain special design features will be incorporated to help the physically handicapped, blind and partially sighted." 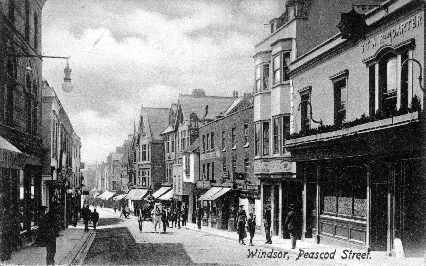 Certain postcard views of Windsor, some dating from 1900 or before, are offered for sale in support of The Royal Windsor Web Site.